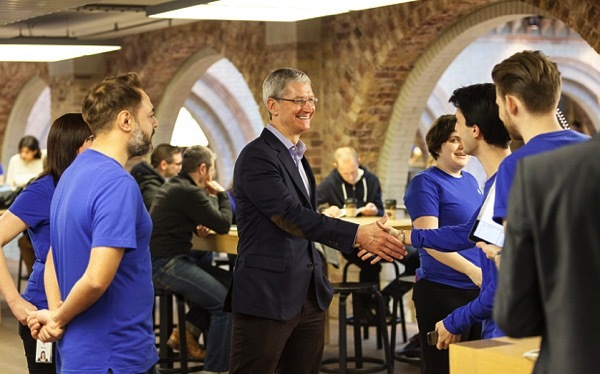 Following his visits to Germany and Israel, Tim Cook stopped by at Apple’s iconic brick-and-mortar store in Covent Garden, London, UK. He and the Telegraph reporter entered the building using the back door – nobody knew about the visit, and the reporter was surprised to find that, unlike some other bosses, Apple’s CEO Tim Cook was welcomed by employees with spontaneous loud applause as soon as he was spotted in store. Apple is preparing for the March 9 event, where it is expected to unveil further details of the highly anticipated Apple Watch. As you may have already guessed, this was the main topic of discussion with the Telegraph as well – everyone wants to know more about the wristwatch Apple is about to launch. There will be lots of other potentially revolutionary uses. The watch is designed to be able to replace car keys and the clumsy, large fobs that are now used by many vehicles, Cook told The Telegraph. This could be a major development and will reinforce the view that Apple is circling the automotive market. Tim Cook apparently corroborated an earlier report that you will be able to use it in the shower as well. As he pointed out, he charges the Apple Watch on a daily basis, and the device lasts all day. He also emphasised the challenge Apple is facing with the Watch: “We’ve never sold anything as a company that people could try on before”, he says. This may require “tweaking the experience in the store”, he told his staff at the Covent Garden store. “I’m proud we stayed true to our North Star”, Cook replied. “We are pro-privacy, pro-environment and pro-human rights.” He added, for good measure, that this was “one of my favourite stores in the world” and praised to the skies the contribution of the retail staff to Apple’s overall success. You can read the full article on the Telegraph’s website.